Central South University (CSU) is situated in Changsha, a famous historical and cultural city in Hunan, China, and covers an area of 2,760,000 m2, with its campuses distributed on the east and west of Xiangjiang River. Backed by the majestic Yuelu Mountain and facing the grand Xiangjiang River, CSU has pleasing scenery and is ideal for study and research. As a top university directly under the Ministry of Education (MOE) of the People's Republic of China, CSU is one of the first universities admitted into “Project 211” (the Chinese government's endeavor aimed at strengthening about 100 institutions of higher education and key disciplinary areas), “Project 985” (the Chinese government's effort to found world-class universities), and “Plan 2011” (the Chinese government's another initiative to improve universities' innovation forces). In September 2017, CSU was enlisted as one of the A-Level "Double First Rate" universities by the State Council. Currently, the Secretary of the CPC Committee of CSU is Yi Hong and the President is Tian Hongqi. CSU was established in April 2000 by merging the former Hunan Medical University (HMU), the former Changsha Railway University (CRU) and the former Central South University of Technology (CSUT). 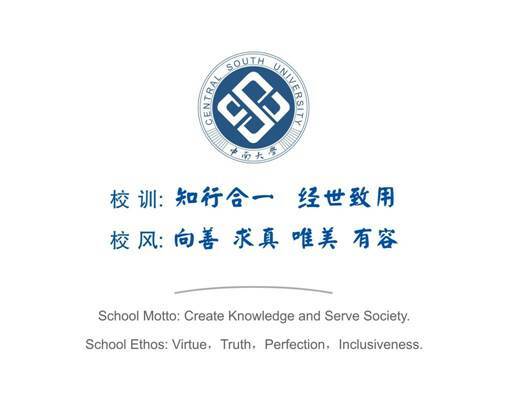 The predecessor of CSUT was Central South Institute of Mining and Metallurgy founded in 1952 and that of CRU was Central South College of Civil Engineering and Architecture founded in 1953; their main disciplines originate in Mining & Metallurgy and Civil Engineering, two disciplines of Hunan Industrial College established in 1903. The predecessor of HMU was Xiangya Medical College founded in 1914 as one of China's earliest colleges offering western medicine courses. Based on its over one hundred years of experience in operation as an education institution, CSU actively responds to the reform of China's higher education, advocates “Learning by Doing and Learning for Using” and pursues “Virtue, Truth, Perfection, Inclusiveness”. Sticking to its own operation characteristics and orienting at major demands of the country, CSU has made great progress in its overall strength through teamwork, innovation and commitment to excellence. CSU has complete disciplinary systems for Non-ferrous Metals, Medicine, Rail Transit, etc., covering Philosophy, Economics, Law, Education, Literature, Science, Engineering, Medicine, Management and Art, and Military Science was embraced. At present, it has 6 national key primary disciplines, 12 national key secondary disciplines, 1 national key discipline (in development) and 61 national key clinical specialties, and sets up 31 schools and institutes with 104 undergraduate majors, 35 primary disciplines authorized for the doctoral degree, 46 primary disciplines authorized for the master’s degree, 2 doctoral degree categories, 23 master's degree categories and 32 post-doctoral research centers. ESIs (Essential Science Indicators) of 15 disciplines including Materials Science, Engineering, Clinical Medicine, Chemistry, Pharmacology and Toxicology, Biology and Biochemistry, Neuroscience and Behavior, Mathematics, Computer Science, Molecular Biology and Genetics, and Social Sciences, Immunology, Psychiatry and psychology, Geoscience and Environmental science and ecology are among the top 1% in the world and the ESI of materials science is among the top 1‰ in the world. 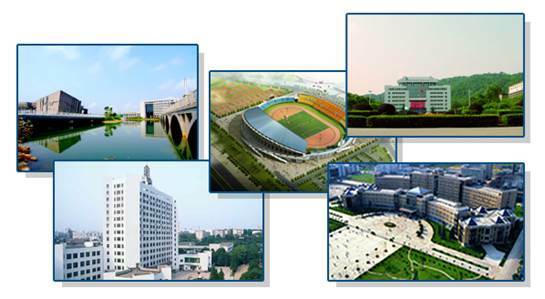 Besides, CSU possesses three large Grade-A Class-Three comprehensive hospitals, i.e., Xiangya Hospital, the Second Xiangya Hospital and the Third Xiangya Hospital, and also has Xiangya Stomatological Hospital and the Affiliated Cancer Hospital, Haikou Hospital and Zhuzhou Hospital of Xiangya School of Medicine. CSU insists in strengthening by talent cultivation, so it has created has a strong faculty including 2 academicians of Chinese Academy of Sciences, 14 academicians of Chinese Academy of Engineering, 17 talents from the national "plan for ten thousand people" , 19 chief scientists of “Program 973” (National Basic Research Program) (2 for the youth project), 52 distinguished and chair professors of “Chang Jiang Scholars Programme”, 7 national famous teachers, over 1,500 professors and personnel with corresponding senior professional titles and 473 experts who enjoy the special government allowance. CSU values moral education and high-quality cultivation, so it has been bettering its talent training model. It has over 55,000 full-time students, including over 34,000 undergraduates, over 20,000 graduate students and nearly 1,647 overseas degree students. The university has 57 national excellent courses, 8 national teaching teams and 8 national experimental teaching demonstration centers. Since it took the lead to set up the innovation-oriented experimental class for advanced engineering talents, it became a pilot university implementing MOE's education and training program for excellence engineers, excellent physicians and excellent legal talents. CSU is one of China's first pilot universities offering eight-year medical education (Doctor of Medicine) and China's first university offering master's programs involving command-skill integration for military officers in active service. In addition, CSU is included into China’s first model universities experienced in graduate employment and is one of the 10 most popular universities among China’s top 100 enterprises. Orienting at the major demands of the country, the university drives collaborative innovation and serves the development of the national economy and the modernization of national defense. It has 22 national-level innovation platforms, including 2 national key laboratories, 5 national engineering research centers, 2 national engineering technology research centers, 6 national engineering laboratories, 1 key national defense science and technology laboratory, 1 national engineering and innovation capacity building platform and 3 national clinical medical research centers. Furthermore, it has led the construction of 2 national “Collaborative Innovation Centers 2011”. Since 2000, the university has won 91 national Three Major Awards for Science and Technology (Award for Natural Sciences, Award for Technological Invention and Award for Scientific and Technological Progress), including 14 first prizes (special prizes) of national science and technology, and 9 projects have been selected into the “Top Ten Progresses in Science and Technology made by Chinese Colleges and Universities”. CSU is an open university. It has established long-term cooperation with more than 200 universities and research institutes in over 30 countries and regions, such as the United States, the United Kingdom, Australia, Canada, Japan, France, Germany and Russia, and has been extensively engaged in industry-university-research cooperation with a large number of multinational enterprises. Overseas students from more than 100 countries and regions study here. Shouldering the historical responsibility on China’s high-level university construction, CSU will accelerate its comprehensive reform and connotative development to grow up into an internationally well-known research university with its own characteristic and make greater contributions to the great rejuvenation of the Chinese nation.